PRICE and PayPal email to send you Money. Anxious to hear from you. Let’s discuss viewing and delivery before we arrange payment. Would you like to see and test ride the trike? Will you be picking it up or need shipping or delivery? No, I have a pickup agent who will be coming on my behalf to help me pick it up after this transaction has been completed. As soon as you get back to me with your PayPal email and pick up location, I’ll proceed with full Payment. I look forward to hear from you soon. I’m sorry. This doesn’t feel right. It seems like a scam. Sorry. Today, I got curious and thought I’d see if I could learn anything about this Charlotte McGeady. I Googled her name plus the email address and got this interesting page. So, it appears my suspicions were correct all along. This Craigslist interaction didn’t feel right from the beginning, this is why. First, someone really interested in a item for themselves will start out either by telling you they like it, or asking a question about it. I realize not everyone may live close enough to see the item in person, but even though I had provided a number of photos, you’d think they’d want to know more. Or maybe, they are a dealer, collector, or some sort of professional buyer. In that case, they’d say so. They’d use their professional reputation to let me know they could be dealt with reliably. But, by starting right out with an excuse “My son who is computer literate” tells me that being deceptive is their first concern. Why tell me what I don’t care about as the very first thing? Let it wait until it comes up in the deal. Second, the only mention of the item being sold was in the subject line. Tells me that the item is not really important to the person. And the price wasn’t under negotiation. Even though I repeated the link to the ad and said the details were there, they continued to ask for the price, as if price didn’t matter. If it doesn’t matter, there’s a good chance they don’t intend to pay. I use Paypal and would feel safe using it, but under my terms. Ask me if I will accept it first. Let me initiate a request for funds. I’m pretty confident I can tell a genuine Paypal email from a fake and know that all I need to do is log in to check if it’s legit, but I know a lot of people are not as experienced and that people prey on that fact. So, at that last response, I’ve pretty much closed the door on Charlotte. I’ll be interested to see if he/she/they pursue it further. I might toy with them for a while, but this fish ain’t gonna bite. the agent’s details where the money will be sent. $900.00USD so that they can release the whole funds into your account. Of course, by logging into my Paypal account, I could verify that nothing had happened and no funds were ever transferred, despite the email’s claims. I am sorry, I just checked with Paypal and they have received no response to the invoice. I cannot assume responsibility for any shipping or payment to third parties. That is your responsibility. I have cancelled the request with Paypal. 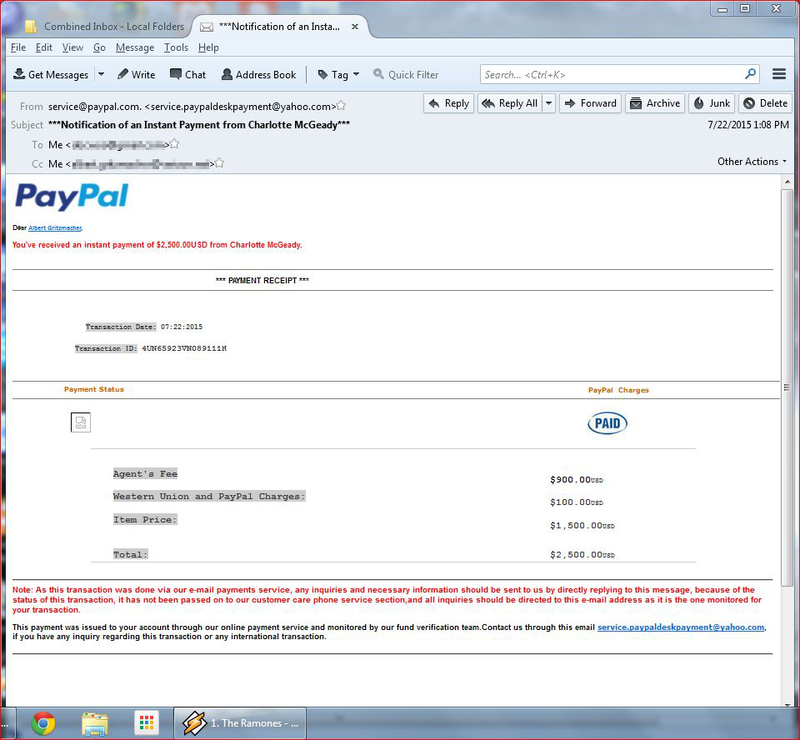 Screen capture of the “authentic” looking Paypal notice. Read carefully alarm bells should go off. 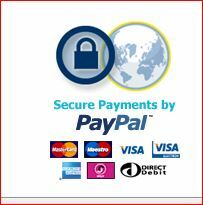 Always work with Paypal through their website’s secure https:// interface. At the bottom of the email, if you could scroll down, you’d see this seemingly legitimate logo to reassure you. Anyone can ‘borrow’ a graphic from a website. An image proves nothing. Thank you very much for posting this information! Charlotte just contacted me about an antique that I had listed on Craigslist. I ,of course, googled her name and was astounded, to say the least! She sent me the very same e-mail that you first described. People def need to be aware. I think I will just remove my listing and keep an eye out for her on Ebay. Thanks again!